Lorries are parked on a Kent motorway for the second time in a week after Operation Stack was brought in. Police said the move on Tuesday evening followed an accident earlier in the day and ferry delays due to bad weather. The coast-bound carriageway of the M20 is closed between Junction 11 at Hythe and Junction 12 at Folkestone with the area being used to manage lorries. Officers said Operation Stack was being implemented because of a backlog of freight waiting to use Channel ports. Motorists were urged to avoid the area and local traffic was being diverted on to the A20, with police and Highways Agency officers managing traffic. Traffic is flowing on the London-bound carriageway, police said. Dover Harbour Board said Channel ferry crossings had been affected by poor weather but the weather outlook was set to improve later on Tuesday. Eurotunnel also had some delays, but said it was continuing to handle traffic. Police said it was the third time Operation Stack had been implemented this year. The move led to fresh calls from Kent County Council for the government to bring in an alternative system. The authority wants to use a contra-flow system with a quick moveable barrier to control traffic which would mean traffic could stay on the motorway. Kent Councillor Keith Ferrin said: "In addition to the many lorries caught up in it, Operation Stack continues to cause immense suffering to Kent residents, business people and visitors alike. "The impact of closing one of the UK's major transport corridors in order to facilitate stationary lorries is extremely detrimental." Last week, miles of traffic built up on the M20 after striking French workers closed the Port of Calais. 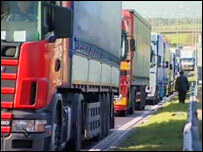 Operation Stack was brought in to allow more than 1,000 lorries to park and the disruption lasted for two days. A plan to replace Operation Stack with a system of lorry parks nationwide was being considered by the government, it was revealed. The proposal had been put together by the Channel Corridor Partnership, which was set up by the regional development agency SEEDA and the councils of Shepway, Ashford and Maidstone.